Diagnosis. The Bufflehead is the smallest of the diving ducks, averaging around 34 cm. Its large, fluffy, distinctly colored head characterizes the male. A large white patch generally originating behind the eye breaks its sheeny head coloring; the steep forehead, short bill, black top and white underbelly also help identify the Bufflehead. The female, while sharing the larger head, lacks the bright colors of the male; its brown head and body is only broken by a small white patch on the side of the head. Natural History. Buffleheads are highly migratory birds, breeding and summering in the northern latitudes of Canada and Alaska, and wintering in the lower 48 states. The males are territorial and aggressive in defending their territory, yet mate with only one female per season—and will stay with the female throughout the incubation of the eggs. The females will lay an average of nine eggs in an unlined hole (the female does not use nesting materials) in a tree—preferably at least 10 feet from the ground. The eggs generally incubate anywhere from 21-31 days, and upon hatching, the male will leave the female. The brood then becomes the female’s responsibility for the next six weeks until they become independent. Within Kansas: The Bufflehead winters in the lower 48 states, and can be commonly seen throughout all of Kansas (indicated by the black dots). 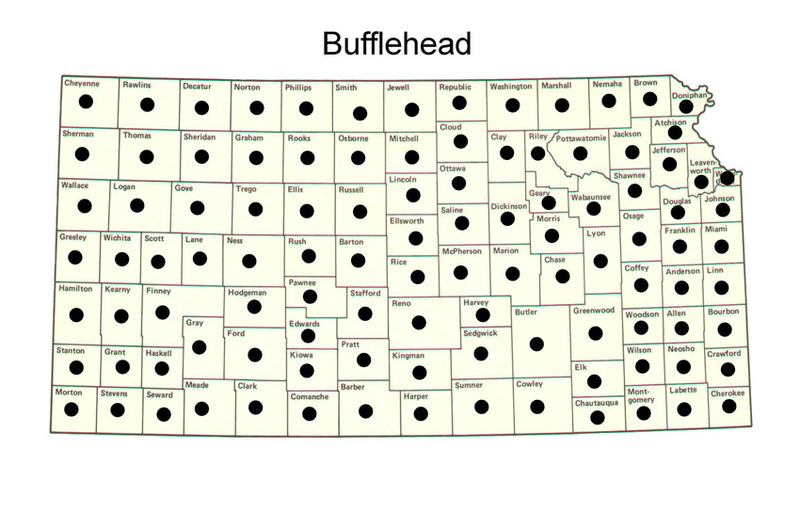 However, as it only winters here, there are no recorded breeding pairs for Kansas (would be indicated with white dots). Within North America: The Bufflehead breeds and summers in northern latitudes, but travels into the lower states for wintering and is commonly seen throughout much of the lower 48 states. Diving Behavior. This is an example of the diving (feeding) behavior of the Bufflehead. Habitat. The Bufflehead generally lives in woodlands near stream or ponds, as well as sheltered bays when migrating. It nests in holes in trees, primarily those excavated by Northern Flickers, and so is rarely seen in territories without Northern Flickers present. Diet. As a diving duck, the Bufflehead feeds mostly on small aquatic life it gathers at the water bottom; however, when moving inland during migration, it may also take in insects and small minnows. Dunn, Jon L., and Jonathan Alderfer. Field Guide to the Birds of North America. 5th. Washington D.C.: National Geographic, 2006. Print. Forbush, Edward H., and John May. A Natural History of American Birds of Eastern and Central North America. New York: Bramhall House, 1955. Print. Usai, Michael L. "Bufflehead." New York State Conservationist 53.4 (1999): 10-12. EBSCOhost.Web. 26 Jul 2012.<http://web.ebscohost.com/ehost/detail?vid=5&hid=15&sid=30dafbee-05d0-45a...@sessionmgr13&bdata=JnNpdGU9ZWhvc3QtbGl2ZQ>.